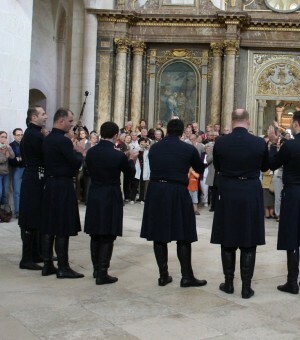 The singers appeared on the “bis” before 400 listeners in the hall of the Abbey by the end of the concert. Association Pontigny`s friends pleased several people on Sunday evening. 400 lovers of music gathered to listen to the ensemble “Basiani” in Pontigny Abbey. They desired to get pleasure from Georgian polyphony recognized by the UNESCO as a non-material monument of cultural inheritance. Georgian special envoy in France and the Mayor of Pontigny were among the listeners. Various and ancient kind repertory was mostly full of accapella piece of music. 10 singers dressed in black traditional clothes gifted us with brilliant concert held in the middle of the Abbey. The repertory, full of church and national songs made the listeners be admired and full of enthusiasm from the very beginning. Labor, admiring, table, wedding and religious kinds of songs were replacing one another. The most attracting journey ended up with deafening applause when the ensemble offered their final piece of music to the listeners followed into the hall.